These are full on glamour, with their fabulous detailing, fabrics and most of all cut, if you’re looking for a dress for any occasion from a big ball to a chic cocktail party – these dresses will take you there in style. 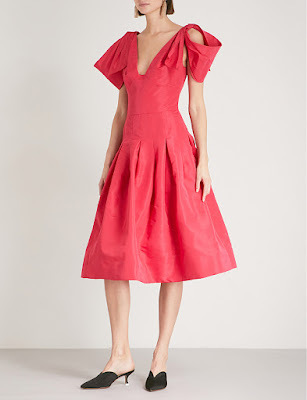 An Oscar De La Renta dresses needs minimal accessories as the fit and the fabric are enough. What’s a red carpet without an Oscar de la Renta gown? If you’re in search of a fantastical confection suitable for only the finest of occasions, waltz straight on over to the feted couturier. Its legacy continues under Laura Kim and Fernando Garcia, who designed this fringed style as a play between opaque and sheer. 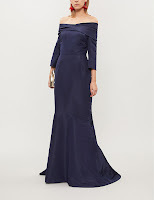 Its strapless bodice and tulip skirt are reminiscent of ’50s frocks – a sure fire way to achieve true star quality. Laura Kim and Fernando Garcia ignore all the stuffy associations attached to eveningwear. Why? Because at Oscar de la Renta they understand that a woman of any age deserves to experience her beauty to its full potential. 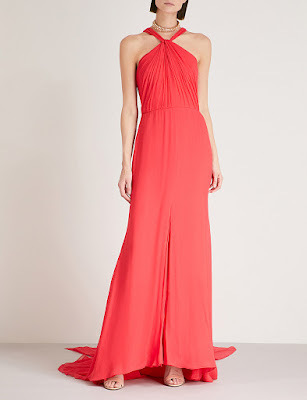 This silk gown for example will make you feel like a queen. Not just any ruler in fact, but the gatekeeper of the label’s Upper East home. Framed with a dramatic off-the-shoulder silhouette, it pools all the way to the floor. With special occasions on the horizon, what better time to call on the help of Oscar de la Renta Creative Directors, Laura Kim and Fernando Garcia. Cut from a lustrous satin-finish silk, this longline dress boasts a shoulder-exposing halter neck silhouette and effortlessly skims the hips all the way to the floor. The hem scoops slightly to the front, perfect for showing off a statement heel, while the elongated train adds drama. 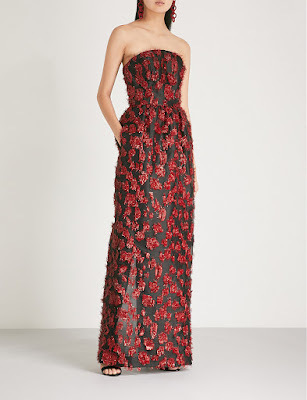 Statement-making silhouettes continue to be a key theme this collection from Oscar de la Renta - a look that’s translated here with this striking fit-and-flare dress. Imagined in pure silk, it fits close to the waistline while the draped sleeves and A-line skirt add volume and drama to the design. The element of surprise is what Laura Kim and Fernando Garcia specialise in at Oscar de la Renta. It’s the key to introduce a new set of followers to the label’s Upper East crowd. That’s not to say this stretch-wool dress doesn’t pay homage to codes, because it does. Flirty through the flared skirt, belted to cinch the waist, and dipped in a saccharine hue, the unusual detail arrives from the sleeves which are split in two to expose the arms. The iconic Oscar de la Renta is known for using vibrant colours that evoke memories of the late founder’s home in the Dominican Republic; so feel free to wear this dress in similarly tropical locales. Woven from pure wool to subtly accentuate the curves of your frame, a knotted tie at the back cinches the silhouette and tempers the flared, ruffled hemline that falls just below knee-length.